The final round of this years Midland Footy League took place at Abington Park in conditions that can only be described as a course setters nightmare. Eventually the wind settled into coming from the northwest early on it was B rig territory for most as the course was being hit by some considerable gusts, a notable exception was Paul Risdale (53 Wice) who started out on his "just'in". The wind eased throughout the day with the skippers gradually going up the sail suits until by the end all seven skippers were on their largest rigs. Going into this final round four skippers all had a chance of walking away as champion however it was clear from the start that Peter Shepherd (65 Fat Boy Slim) was not going to relinquish his title easily. It was his to lose however he held his nerve and kept notching up race wins to come out well ahead in this final round. Back in the pack things were far from clear cut, Peter Jackson (30 Fat Boy Slim) had a series of uncharacteristic equipment failures which saw him finishing the event 4th, with a borrowed Slim putting him out of contention for the Dead Tree Trophy. 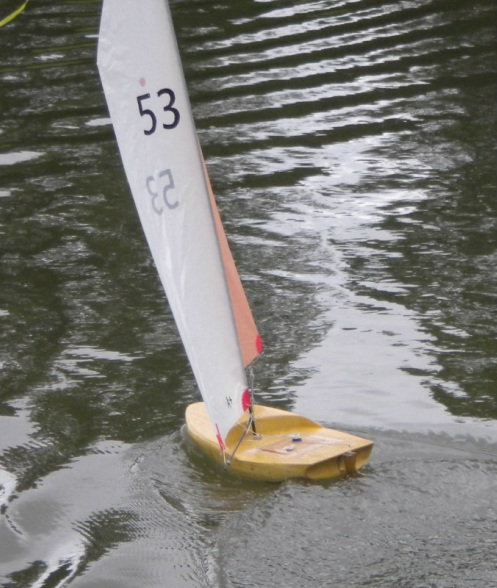 After sailing his socks off in the Cadenhead Trophy last weekend, Mike Ewart (36 1299) had a day to forget, and reunited with his Iambus 2 David "hang on while I change my sails" Wilkinson (46, Iambus 2) could only manage third behind the best of the rest skipper Paul Risdale (53, Wice) who finished second. Sid Sims (05 Iambus) finished fifth just one point ahead of Mike , indeed there was only ten points between second and sixth showing just how close it was. Geoff Raygada completed the picture his points total being hampered early on by getting to grips with his new, beautifully finished Fat Boy. His results started to improve once a couple of seasoned veterans of the Footy Class gave him the benefit of their experience and adjusted (it might look agricultural Geoff but it works) his rig. His results improved greatly in the afternoon and with a couple more results like races 10 & 14 he could have closed the gap to the others..
At the start of the day it was all very close for the overall competion, however Peter Shepherd never opened the door to allow the others a sniff of victory and so becomes 2014 Midland Footy League Champion retaining his title from last year, despite having a torrid event this time Peter Jackson just managed to hold onto the runner up spot with David Wilkinson third virtue of finishing ahead of Mike at this event. 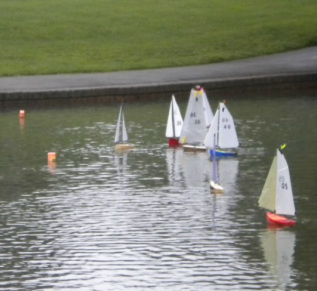 The introduction of the Dead Tree Trophy in 2014 has seen the nature of the Midland Footy League change with the majority of skippers now building their own boats, some of which have been more successful than others, however even the failures give you something to learn from. The standard of sailing keeps improving and it has led the competition on the water being closer than ever, Peter Jackson was unfortunate not to carry off the trophy this year having been involved in producing two of the best boats out there the Red Box and a Fat Boy Slim. 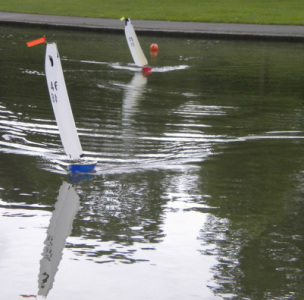 It has also helped to dispel the idea that the only way you can win in the footy class is to build in carbon fibre, with some of the boats from the league going on to have respectable results in the Footy Open competitions. The final results are shown below Peter Shepherd's four wins in the last four events with his Fat Boy Slim being enough to secure him victory.